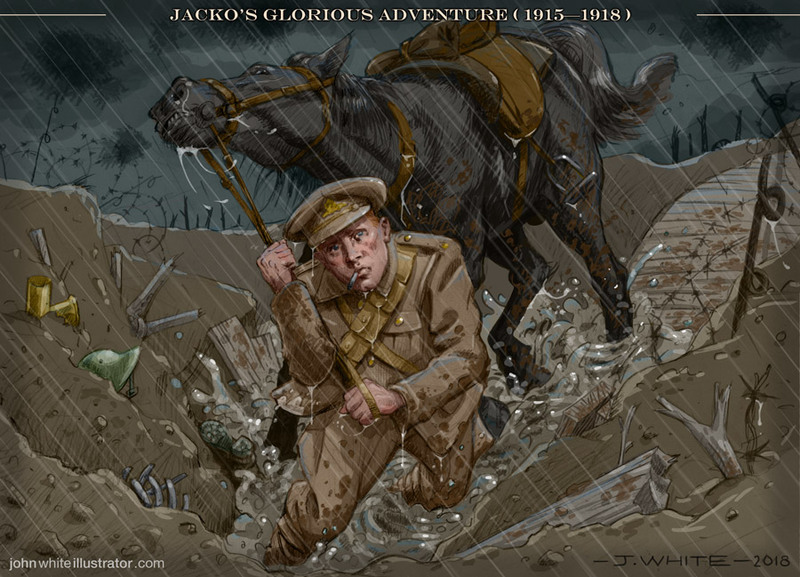 A picture that’s close to my heart: It’s the first time I’ve ever depicted my grandad—Jack White—on the Western Front, in WWI. Pencil on paper, digitally coloured and finished. There are none of the usual Boy’s Own Ripping Yarns heroics here. It’s just mud, rain, mundane drudgery, and a will forcibly bent to doing one’s duty. No matter how senseless the project increasingly seems to be, no matter the demoralising losses of life. No matter if it will soon kill you. Above: The face of someone who is doing their gruelling duty without complaint, but with the vacant stare of resignation. An unthinking cog in a big big wheel. 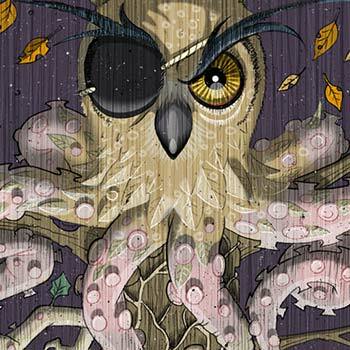 I had an intention to create another one of my c.A3 size paintings on board, and digitally colour it. So sketched a rough composition on A4 office paper. However, once I’d been unable to resist working that same drawing up more and more, I decided to try scanning what I had and bringing it onto the computer. Because there’s no paint—only light pencil—in the paper image, it took a lot more work at the digital stage. I found lots of visual references for the Royal Horse Artillery and Royal Field Artillery online, and I had 1 photo of my grandad in uniform. But I resisted, as I always do, the urge to simply trace his features. I hate work that’s copied from photographs. 1. I can’t see the point in replicating something. 2. Something inside just rebels against tracing—even for small elements in larger compositions. Tracings and slavish copies from photographs just have a certain look, which lacks authenticity. For me. With his photo pasted in alongside, I did digitally select a few areas of his face that I’d drawn and move them around slightly, and I added a little more shading. The original photo that I referred to is 3/4 view, for my near straight-on view. You can see in the drawing on paper below, that the face changed a little bit. Each time I left the computer and returned, I’d make another change or 2. 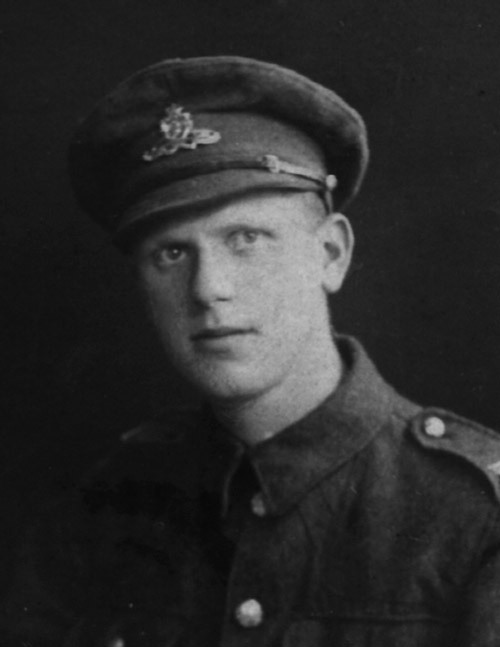 Jack White, from Liverpool (like me), was posted to France on the 28th of November 1915. He was in the Royal Field Artillery, and Royal Horse Artillery, in the 151st and 255th brigades, attached to the 51st Highland Division. 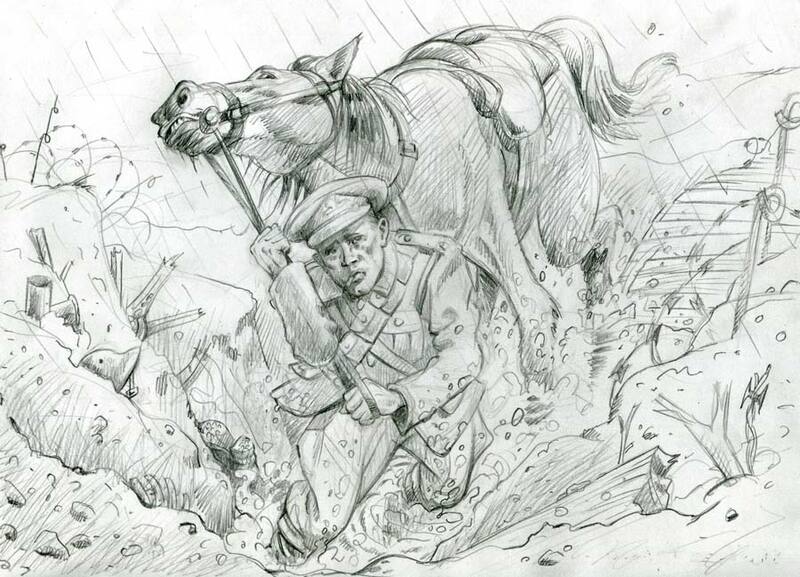 A ‘Driver’ of horses, ammunition and big guns—often at the front lines—he saw terrible things that no one should ever see, and suffered severe injuries that stayed with him for life. 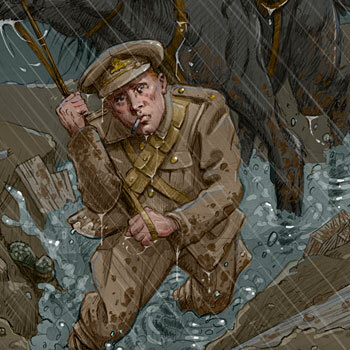 He saw his friends killed, and took part in the battles of Ypres (‘Wipers’), Mons, and Paschendale. Despite what people thought back at home, it wasn’t a rippingly good fun, glorious and heroic adventure on the Western Front. 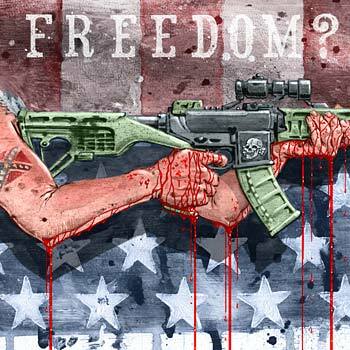 This image is roughly what formed in my imagination from those words. 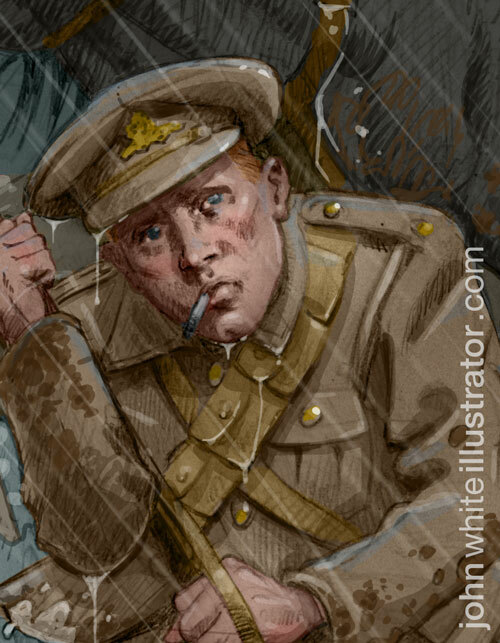 During my childhood, I loved what I now consider to be the greatest comic series of all time, ‘Charley’s War’ in the UK comic ‘Battle.’ Pat Mills’ writing was exceptional, and groundbreaking. 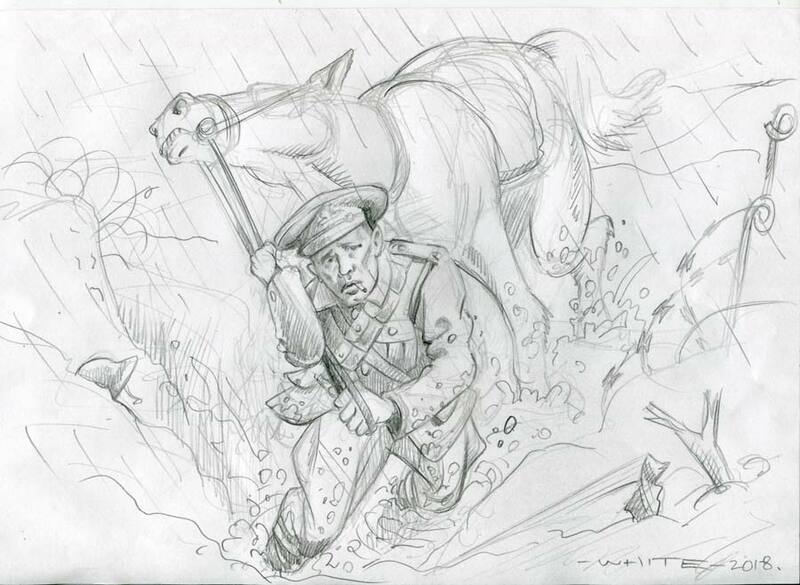 Not only that but through his amazing artwork, the late Joe Colquhoun made drawing WWI look easy. The series was raw, shocking, funny and often very moving. Above: (detail) Jack c.1915? Age 18 or 19. He lied about his age, to get in.